More than at most times of the year, food is available for poaching by your pet from unattended buffet tables, unguarded plates or overflowing garbage cans. Some popular holiday foods, such as turkey, can be fatal if your dog eats the bones. Garlic and onions are also potentially toxic. And any holiday food is richer than your pet’s normal diet and can cause severe intestinal distress. Plus, dogs digging food out of the garbage after it has been sitting for a while can get food poisoning, just like people. Most people know that chocolate can be toxic for dogs. And while most cats are not likely to actually eat chocolate, they might enjoy batting around a bowl of candy – which is less than appetizing for your guests. Be sure to keep candy out of the reach of your pets. Unattended, half-finished alcoholic drinks can be very attractive to your dog or cat – and they can make your pet very sick. Similarly, some dogs love to chew on cans, which can tear up their intestines if they swallow the metal pieces. 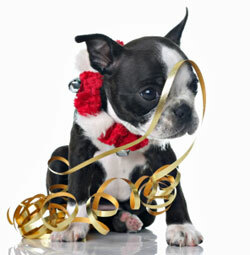 Some holiday plants, especially poinsettias and mistletoe, can make your pet sick. Glass or plastic ornaments can end up being chewed on and ingested, which can have serious results. Tinsel is a particular problem for cats. They love to bat at it, then they can eat it when it falls off the tree or wraps around their paws. Once in their digestive system, it can cause a very serious blockage. And of course, pets running around or climbing up the Christmas tree can cause the tree to topple. Entertaining is a huge part of the holidays, so think about your pet’s safety if you are having a gathering. For example, visitors can leave their coats or purses lying around, giving pets access to dangerous substances such as medicine and cigarettes. Also, your pets probably live a pretty quiet life most of the time, and they might be upset or disoriented by the hustle bustle of the holidays. Different pets react differently – some might try to bolt, some might hide under the bed, some might become so frightened that they growl or hiss at, or even bite, a guest. If your pet is nervous around strangers, consider providing a safe place, such as a room or a crate, where the pet can feel secure.